Normal transactions in Axe only need to be approved by the person sending the funds. The Axe Copay wallet supports multisig, short for multisignature, meaning that it is possible to require more than one key to approve a transaction. This can be used like a joint checking account, or in situations where majority approval from a board is required to create a transaction. This documentation describes how to set up and use shared wallets. Before you create a shared wallet, think about how many people should have access to it, and how many of those people will be required to authorise a transaction. Is it just one or two? Or a majority, or even everyone? Shared wallets allow you to specify a total number of copayers and a required number of signatures to create a transaction. These are often referred to as M-of-N transactions, where for example 2-of-3 signatures are required to transact. In practice, this is used to share responsibility for the funds between several people. It is not possible require a certain person, such as the manager, to be one of the copayers (although adding a password only the manager knows can have the same effect). Shared wallets are inherently risky because if more than the minimum required number of people involved lose access to their keys, the funds will be inaccessible forever. Make sure everyone understands the risks and responsibilities of shared wallets before committing significant funds. 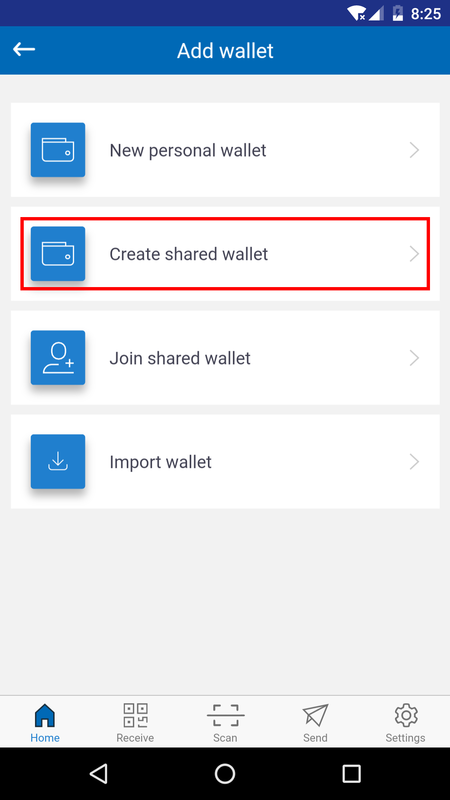 Funds and addresses in shared wallets are managed separately from your personal wallets, so you will need to create a new wallet and then add copayers before you can begin creating transactions. From the Home screen, click the + button at the top right to add a new wallet. 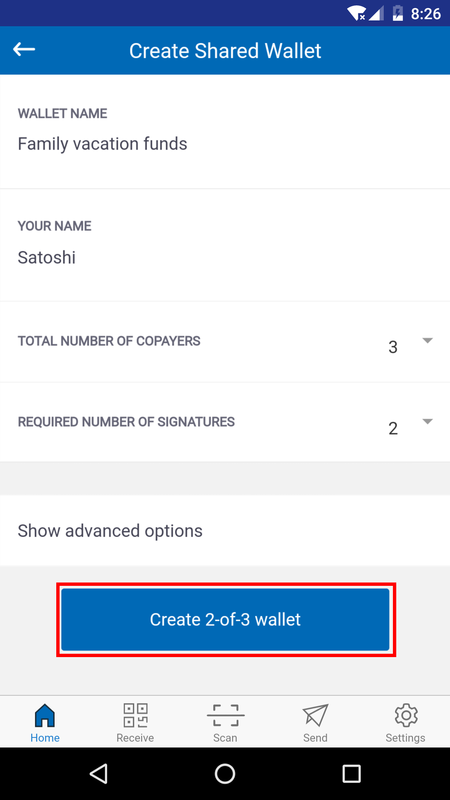 Select Create shared wallet and enter a name for the wallet, your own name, the total number of copayers and the required number of signatures for a transaction. Tap the Create m-of-n wallet button to create the wallet. The wallet will appear with your other wallets, listed as Incomplete until the copayers have joined. 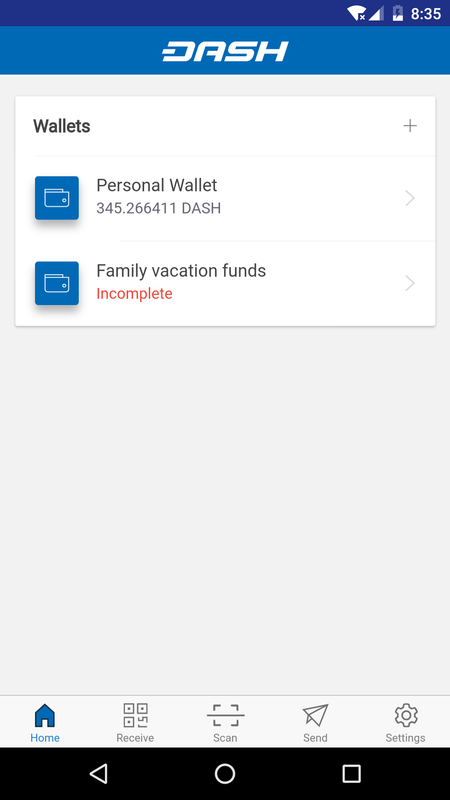 Tap the incomplete shared wallet when you are ready to add users. A QR code will be displayed. 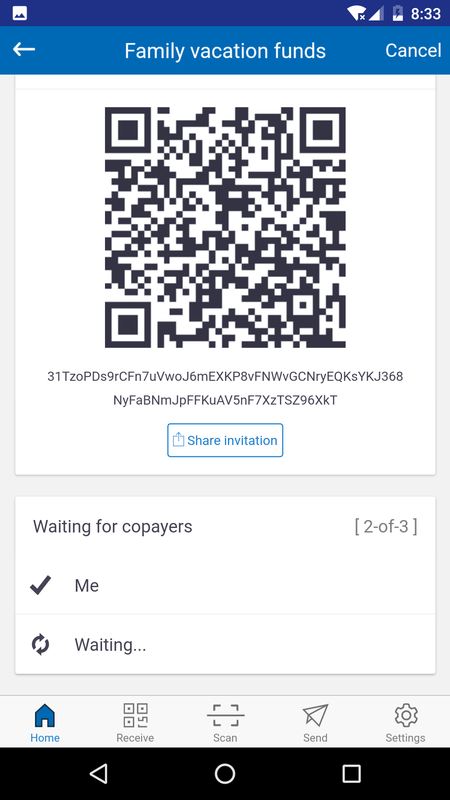 Have your copayers scan the code or share it to them by email or instant message by tapping the Share invitation button. 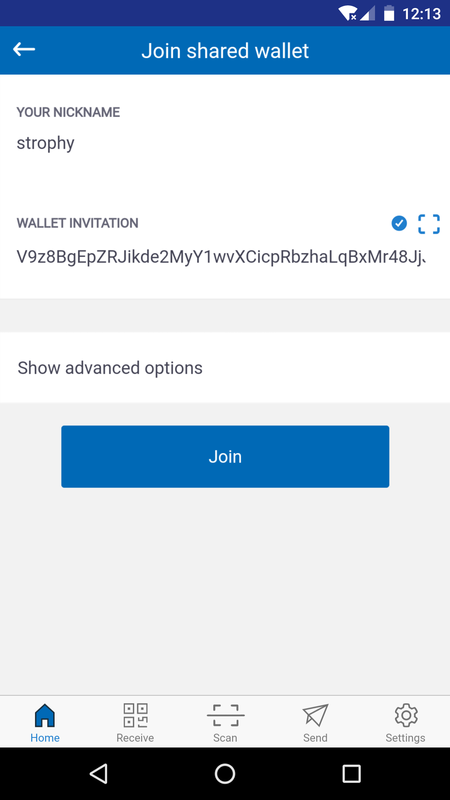 Once everyone has scanned the code and entered their name, the wallet is ready for use. Simply tap the wallet to display addresses for receiving funds, but note that the addresses begin with 7 instead of X to indicated they are multisig addresses. 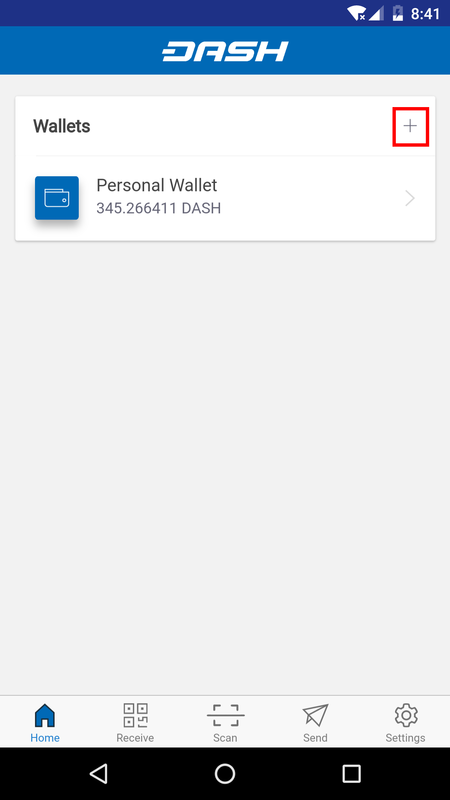 It is possible to receive Axe to a shared wallet in exactly the same way as a normal wallet. Only sending Axe requires participation from the copayers.